Promobot is unique technology that allows to get feedback from the clients in the most accurate and honest way. The robot listens to what people say, then our experts upload all verbal requests from clients. In order to obtain the necessary information, client may just ask the robot a question. 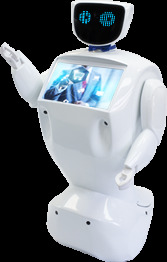 Robot programmed to your product with smile and pleasure will advise on any matter, without any tiredness and breaks. Robot with the unique appearance can win any customer. And voice modules aimed to sell will not allow the customer to leave with empty hands. Robots as employees help to stand out among your competitors. Company that uses high technologies become the most popular among clients. Do you have a new product or change in old one? No trouble! Promobot will easily learn all the necessary data, and our experts will help it to do this in a short period. Promobot is your worker that will know all your products. It quickly learns all innovations, and without any notes will tell the clients essential information.